Celtic F.C. (my team) have won the Scottish Premier League with a 1-0 win over Dundee United. All Hail the Returning Champions! The win gave Celtic, who at one point was 9 points behind their cross-town rivals Rangers toward the beginning of the season, the League Title, completing a spectacular rally. This title gives manager Gordon Strachan the honor of being the first Celtic manager since 1956 to win the league three times in a row. The lone goal was hit by Celtic striker Jan Vennegoor, his 20th goal of the season. He scored off a cross by Paul Hartley in the 71st minute of play. Artur Boruc, Celtic’s Polish goalkeeper, played brilliantly, saving all of the efforts United made to score. 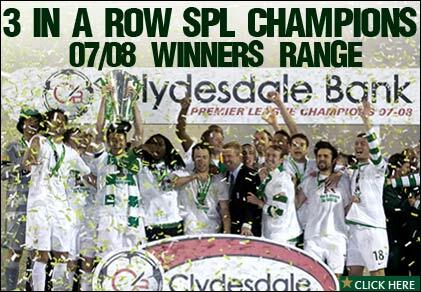 The match finally ended with the referee’s final whistle, declaring that Celtic had once again won the League. Unfortunately, I did not get to actually watch my favorite team win, but I am pumped none the less. Time to roll out my Celtic F.C. jersey and revel a bit. Edinburgh is perhaps the greatest city in all of Scotland, and rightly so, as it is the capital of this proud nation. It has successfully mixed history with modern culture. The city lies on a number of extinct volcanoes and rocky crags which rise from the generally flat landscape and overlooks the shoreline of the Firth of Forth to the north. Robert Louis Stevenson, and Sir Walter Scott called this city home. The city is divided into two, very distinct sections. The New Town was systematically laid out during the Enlightenment and is made up of cosmopolitan buildings. The Old town, is a typical mideval setting, with cobblestone streets, dark, narrow alleyways, and stone-sided buildings. Set on a crag in the Old Town, stands Edinburgh Castle. The castle is Edinburgh’s best known and most popular attraction. It has breathtaking views of Edinburgh and is interesting to young and old alike. Several military reenactments take place here every year and the most famous cannon in the world: Mons Meg is fired daily at 1 p.m. A wonderful look at the wild beauty of Scotland’s scenery can be had immediately beyond the palace in Holyrood Park, which is dominated by Arthur’s Seat, a volcano. In August and early September, around a million visitors flock to the city for the Edinburgh Festival. You can also visit the National museum of Scotland which houses many of Scotland’s most precious artifacts. One note about the timing of your visit: Scottish winters are frigid!